Rich crescent-shaped almond cookies with a light, crunchy texture. Despite the powdered sugar, they're not too sweet. They're easy to make. These cookies have a delicious crumbly texture. I’m not a fan of confectioners’ sugar, but the coating on the on the outside works perfectly. I suppose you could use 8 ounces of almond flour, but leaving the skins on provides a darker result and more flavor. 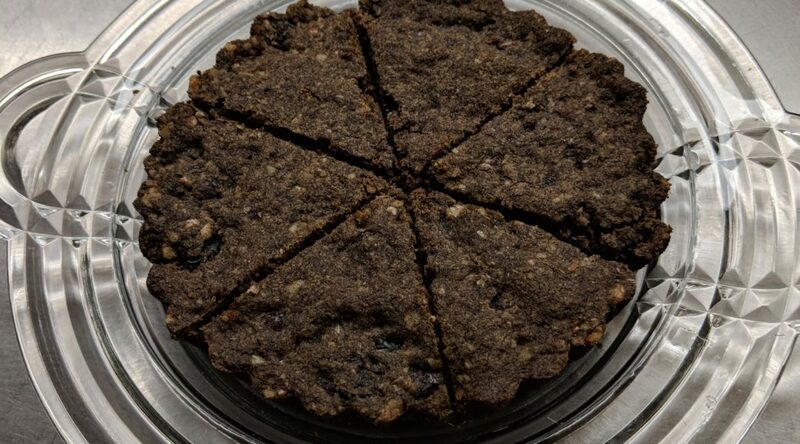 to make a uniform dough. 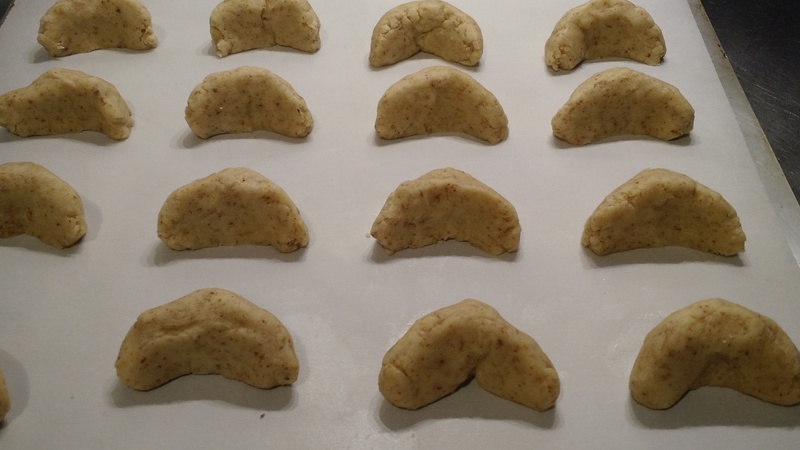 &diamondsuit;ATTN Using cake flour provides the cookies with a better texture. Place the covered dough in the refrigerator for 1-2 hours. Preheat the oven to 325º F. After the dough has rested, measure out uniform pieces. I used a scale and aimed for 22g pieces: they’re a little bigger than I’d have liked because (to my surprise) the dough rose a bit as it baked. You can just use a spoon or approximate uniform pieces with your eye: &diamondsuit;ATTN that’s better for your mental health. Line two cookie sheets with parchment paper. Form crescents, making sure they taper down at the points. Place the cookies on the parchment-lined pans: they can be fairly close because they don’t expand much. Kiffling waiting to go into the oven. Bake for about 12 minutes and then check on them. If you need to rotate the racks or swap the racks top to bottom. Keep an eye on them until they are golden. At the size I made the cookies they took about 22 minutes to bake, but your timing may vary. You definitely want the cookies watch the cookies until they take on a nice color. 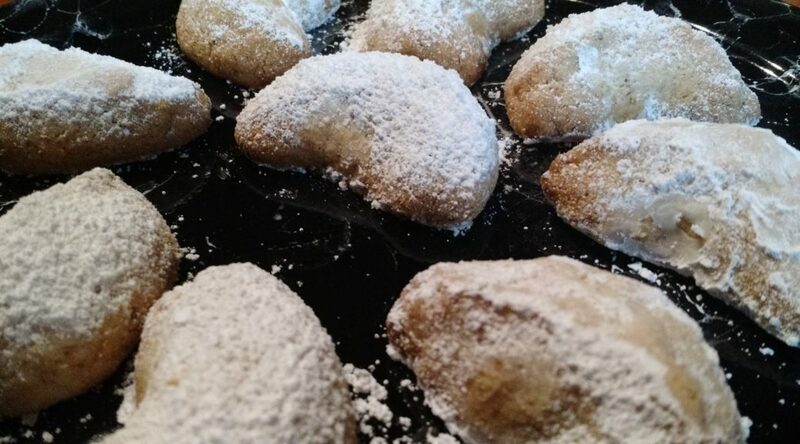 When the cookies come out of the oven, coat them in confectioners’ sugar. The cookies can break, so my approach was to dust them using a strainer with confectioners’ sugar right over the cookie pans. Then I used a spatula to move the cookies over a little to place the bottoms onto some of the spare sugar on cookie sheet. Some people dust them a second time after they cool, but it’s more sugar than I like. From my sister, Mindy, who probably got it from a family friend. If you have a food processor, it will make chopping the nuts and pulverizing the vanilla wafers, but do each one separately. Next time I make this I’m going to grind the pecans instead of chopping them. Mixture should be refrigerated a couple hours (or overnight) to allow the dry ingredients to fully absorb the liquid. Roll into small balls. (I overthought this and weighed them to target about 14g each.) 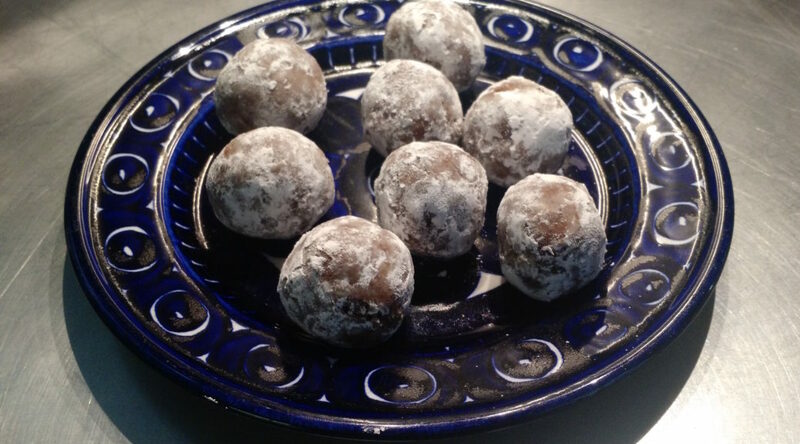 Roll in confectioners’ sugar. Store in refrigerator. NOTE: The original recipe made double this quantity, and Betty suggested making half with cocoa and half without cocoa. From a dear family friend, Betty Rosen. I get a smile on my face every time I think about her. Pulse together the flours, sugar and salt in a food processor. Add the butter and honey and pulse to fine crumbs. Pulse a few more times until some of the crumbs start to come together, but don’t overprocess. The result will be like powdery crumbs when done, not at all like dough. Press the “dough” into an even layer in an ungreased 9 x 13 pan, pressing fairly firmly to compact the dough. Bake until golden brown, 25-30 minutes. Transfer to a rack to cool. Cut into bars, &diamondsuit;ATTN while still warm. Based on a recipe from Melissa Clark. And now the short history lesson, for those of you who were playing hooky that day: ANZAC stands for Australian and New Zealand Army Corps, the forces that fought in the First World War. You remember: the Great War, the War to End All Wars and all that? and add to the butter mixture. Mix butter mixture and dry ingredients. Add a little more water if the mixture is too dry. Drop teaspoons of mixture onto tray, allowing room for spreading. Bake for 10 to 15 minutes or until golden. Allow to cool on tray for a few minutes before transferring to cooling racks. &diamondsuit;ATTN Golden syrup is a thick, amber-colored form of inverted sugar syrup. The best-known brand in the UK is Lyle’s Golden Syrup, which is now distributedin the U.S. If you can’t find it, look for King brand syrup or substitute a mixture of honey and corn syrup. From an original recipe provided by Bob Lawson, an ANZAC present at the Gallipoli landing. Chocolate, cinnamon and not too much sugar. Oh yeah, cayenne! Turn mixer to low speed and gradually add the sifted dry ingredients, scraping the bowl with a rubber spatula and beating only until mixed. Toward the end of the mixing, if the dough starts to crawl up on the beaters, remove the bowl from the mixer and finish mixing with a spatula. Lightly flour a cutting board or counter. Turn the dough out onto the board. Lightly flour your hands and shape the dough into a cylinder about 10 inches long and 2 inches in diameter. Try to make this as even in diameter as you can. Wrap the cylinder of dough in wax paper and place it in the freezer until firm (or keep it frozen for as long as you like). Before baking, adjust two racks to divide the oven into thirds and preheat oven to 375°. Unwrap the dough and place it on a cutting board. With a paring knife and a ruler, place marks every 1/4-inch down the length of the cylinder. With a sharp, heavy knife, cut 1/4-inch slices. Place the slices 1–1/2 to 2 inches apart on unbuttered cookie sheets; the cookies will spread a bit as they bake. Bake 10 or 11 minutes, reversing the sheets top to bottom and front to back once during backing to insure even browning. The cookies are done when they feel almost firm to the touch. &diamondsuit;ATTN Watch them carefully to be sure they do not burn. If you bake only one sheet at a time, bake it on the upper rack; the cookies will bake in less time with only one pan in the oven, so watch that they do not burn. Let them cool for a few seconds on the sheets until firm enough to transfer to a wire rack. Then, with a wide metal spatula, transfer the cookies to racks to cool. Store cookies in an airtight container. They freeze well. These are crisp, spicy and they’d last a long time if they weren’t so addictive. into thin slices and then crosswise to make pieces about the size of small green peas. Scissors may make this task easier. Set aside. and add to dry ingredients. Stir until the dry ingredients are completely moistened. Place two 18- to 20-inch lengths of plastic wrap on the counter. Form two strips of the dough, one on each piece of plastic wrap. Do this by spooning half of the dough by heaping tablespoonfuls in the middle, lengthwise, of each piece of plastic wrap to form strips about 13 inches long. Flatten the tops slightly by dipping a large spoon in water and pressing down on the dough with the wet spoon. Keep wetting the spoon to work the dough more easily, as the dough is sticky. Lift the two long sides of one piece of plastic wrap, bringing them together on the top of the dough. Press the plastic wrap in place on the top, and, using your hands, smooth the dough to form an even strip about 13 to 14 inches long and 2–1/2 to 3–1/2 inches wide and no thicker than 3/4 inch high. If any air bubbles form, pierce a small hole with the tip of a sharp knife to let the air escape, then press on the plastic wrap to spread the dough into that space. Shape both strips, place on a cookie sheet and freeze for at least an hour or until firm enough to unwrap (or as much longer as you wish). To bake, adjust two racks to divide the oven into thirds and preheat oven to 300°. Line two large cookie sheets with baking parchment or aluminum foil, shiny side up. Place one strip of dough diagonally on a lined sheet, and slowly peel the plastic wrap off the dough. Repeat with the second strip of dough and the second cookie sheet. Bake for 50 minutes, reversing the sheets top to bottom and front to back once during the backing to insure even baking. These will turn quite dark during baking. Reduce the oven temperature to 275° and remove the sheets from the oven. Immediately—carefully and gently—peel the parchment or foil away from the backs of the strips and slice the strips while they are still very hot. On a cutting board, use a clean towel to hold a strip in place and slice with a serrated knife. Slice on an angle; the sharper the angle, the longer the cookies, and the more difficult it will be to slice them very thin. Do your best. Cut them about 1/4 to 1/3 inch wide. 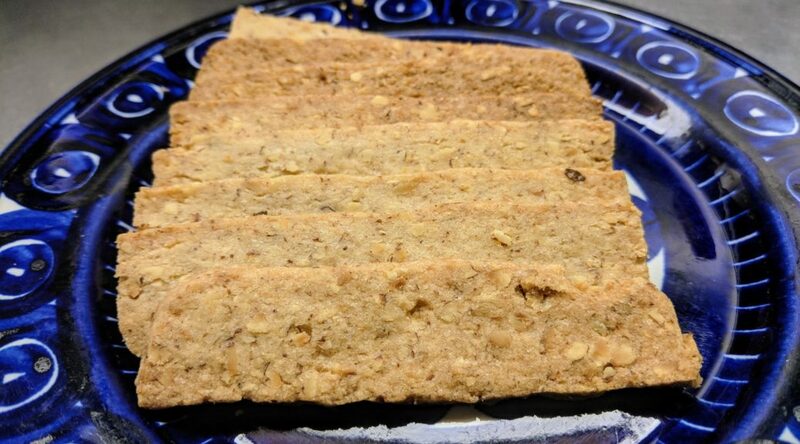 &diamondsuit;ATTNI have an electric slicer and it lets me make incredibly thing biscotti. Place the slices on a cut side on the cookie sheets; don’t worry about leaving any room between the biscotti. Bake at 275°or about 25 minutes. (If you re-bake the biscotti one sheet at a time they will bake in a bit less time.) Because these are so thin, you will not need to turn them upside down during the second baking, but you should reverse the sheets top to bottom and front to back once during the baking. Bake just until dry; you will need to test them when they are cool to know if they are crisp enough. Do not overbake. Store in an airtight container after they cool. Real chew-food: the uncooked oats are delicious and not overly sweet. Heat oven to 325° F. Combine all the ingredients in a bowl with a wooden spoon or your fingers. Butter a 9×13-inch pan and put the dough in it, pressing down and evenly distributing dough. Bake 30 minutes. When cool, cut into squares. Preheat oven to 350 F convection. Sift together (through a strainer) 1 cup + 2 TBL flour, 2/3 cup cocoa and 1/2 tsp baking soda. In a medium saucepan, melt 1–1/2 sticks (3/4 cup) butter. When thoroughly melted, add 1 cup sugar and 1/4 cup corn syrup. Stir and remove from heat. Stir for one minute to help some of the heat dissipate. Add 1 beaten egg. When incorporated, add the dry ingredients. Add 1–1/2 tsp vanilla. Form into 1–1/4” diameter balls (I have a 1–1/2 tsp scoop that does this), and place onto parchment paper-lined baking sheets. Bake for 11 minutes. Cookies will fall after they come out of oven and form chewy chocolate wafer. Baking them a little longer will produce crisper cookies. Let rest for 2-3 minutes before removing to a rack to cool. Makes about 5 dozen small cookies. NOTE: the dough will get stiffer the longer it sits and this will change the way the cookies come out. I prefer to work quickly but the cookies are great either way.